Lanolips Lemonaid Treatment: This is an all time favourite lip balm, that I have repurchased several times because it was the first treatment that helped my lips after that rough patch in late 2015. It delivers a powerful dose of hydration to the lips and also exfoliates slightly, leaving my lips very soft and supple. If you are suffering from dry, sore lips then you need to try this. Korres Lip Butters: Korres do a really lovely range of tinted lip butters in a variety of scents/colours. I have Jasmine, Pomegranate, Quince and Wild Rose. These lip butters are extremely moisturising due to their shea butter content and they make my lips extremely soft and slightly glossy due to the tinted finish. They are perfect for minimal or no makeup days when I don't want my lips to be completely bare. My favourite is Jasmine due to it's natural pale pink colour. I know that not everybody likes pots, but they also make a stick version of these. Benecos Mint Lip Balm: Benecos is a very affordable, organic, cruelty free brand and they have a range of stick lip balms; one unflavoured, orange, raspberry and finally, mint, which was kindly sent to me. This is a really moisturising lip balm and I love how refreshing the mint flavour is without being tingly or uncomfortable. It contains a number of oils and butters, and is a great all round lip balm at the very affordable price of £2.45. DIOR Dior Addict Lip Glow Lip Balm: At the other end of the price scale is this beautifully packaged stick lip balm from Dior. Not only is this balm moisturising, but it also adds some colour by reacting to the chemistry of each individual's lips to enhance their natural colour. It is expensive at £24, so I can't say that I will repurchase it but I really like it and it definitely isn't a case of style over substance. Moo Goo Cow Lick Lip Balm: If you haven't tried any Moo Goo products, you are missing out! They are perfect for sensitive skin/hair/lips and are very effective. This stick lip balm is completely edible (yes, you read that right!). soothing and moisturising. If you have a lot of allergies, this is the lip balm for you. 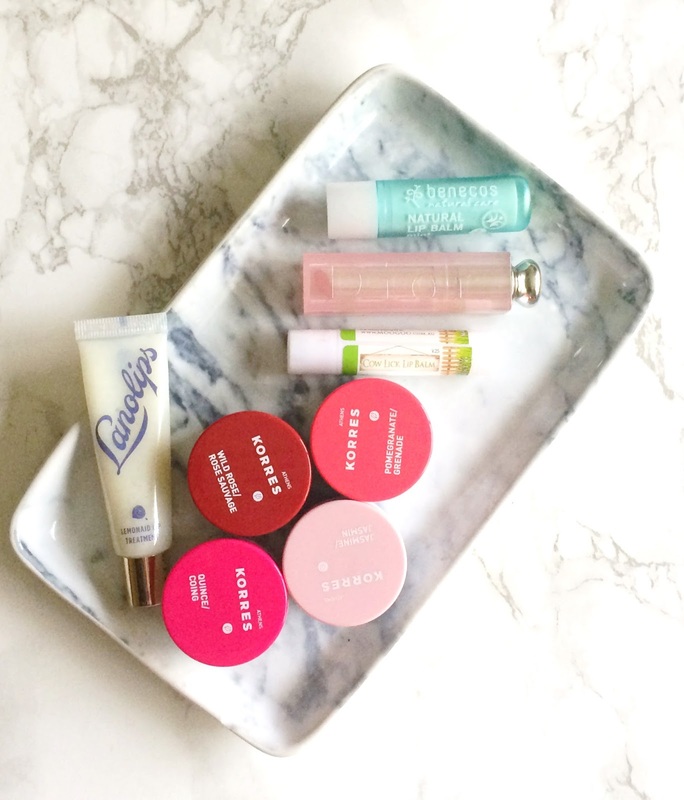 Have you tried any of these lip balms? I would love to hear your thoughts on them and also, what your favourite lip balm is? Is it a daily essential for you? I'd love to hear in the comments below! All products are bought by me, unless otherwise stated. In this case, the Korres & Benecos lip balms were sent to me. Opinion is always my own.